Have you noticed that markets have been behaving very differently from the usual recently? · There has never been a phase where the markets P/E have been above 26 for such extended time frames. · This is the first time the growth in corporate earnings has been low for such a long duration. In our blog – When are equity returns better than “bank” returns? , we had analyzed the chances of generating returns that would beat the bank at various P/E levels. Investments made when the P/E is high will need longer holding periods (3 years if the P/E is above 24). On the basis of our analysis, it was reasonable to expect companies with extremely high market capitalizations to do well when their P/E’s are high. This year has been poor in terms of returns. Sensex returns was not reflecting the experience of most investors. We decided to do a deep dive. This in-depth investigation has thrown up some interesting insights. Before we proceed further, lets iron out a few technicalities. A couple of years ago, we started classifying companies using the average market capitalization as the base, rather than using specific numbers. For instance, a company with a market capitalization of 10,000 crores is now classified as midcap, whereas it was tagged as a large cap a couple of decades ago. We started using number of times the average to classify companies, as this provides a more robust framework to compare companies across time periods. To analyze companies by size, we categorized them on the basis of their relative market capitalization (relative to average market cap for the year). 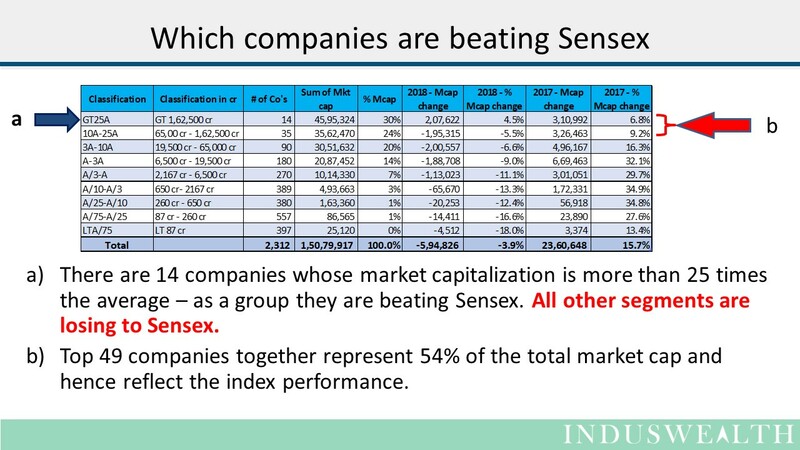 Based on this data we can infer that if we take away the performance of the 14 companies, then all other segments on an average are losing to Sensex. Please note that in each segment there will be some companies that are beating the market, but on an average the segment is losing to the market. Today the Sensex returns are reflecting the performance of very few companies and is not even representative of the performance of the top 50 companies. Based on the average, it may be reasonable to deduce that most investors and funds will be trailing Sensex, except for the ones that have been invested in ultra large cap companies. Investors who missed just 46 days in the last 27 years would have missed out 75% of the returns, and they would have realized a return of 4.1%. Staying invested is a good strategy. The current Sensex performance is driven by very few companies and is not representative. All other segments other than GT 25A are experiencing drawdowns and hence this could be the case for many portfolios. Although we are strong advocates of bench marking portfolio performance to a representative index, we believe that the current index does not reflect the experience of the broad market. Investors may want to look at the fundamentals of their holdings for making any decisions. The current P/E levels are being sustained at high levels and, with no historical precedent, we are in uncharted waters. Current markets are suitable for investors with more than a 3-year horizon and for those who are ready to face short term draw downs and carry on investing. We hope you find this article informative.